The campaign calls itself “the grassroots campaign” ! It has a survey on the website, which is intended to demonstrate a lot of local support for expansion. But like so many surveys, set up to try to prove a particular point of view, it is worded in a very biased manner. It is not possible to fill in the survey from a point of view of not wanting Heathrow expansion. Therefore, when its results are published and used as “proof” of a high level of support, this should be viewed with considerable scepticism. The way in which the survey is constructed cannot accurately give that proof – as it is poorly constructed. Heathrow airport is spending thousands of pounds on a “grassroots” campaign to build support for a third runway. 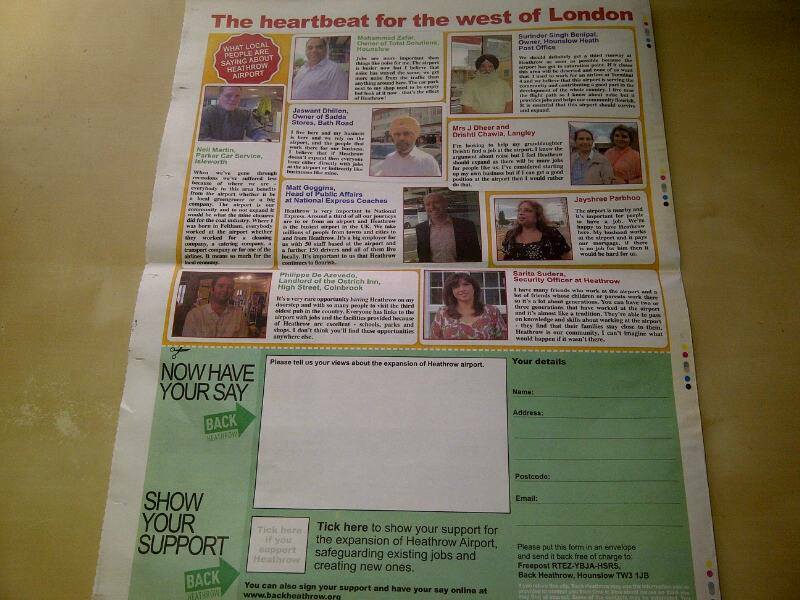 Half a million newsletters will be sent to west London homes in the first move by the campaign group Back Heathrow. Campaign director Rob Gray said his group wanted to give a voice to the “silent majority” of locals who oppose it being shut down under plans by Mayor Boris Johnson. But anti-Heathrow expansion group Hacan said its formation was “the actions of a desperate organisation, not confident of the arguments it is making”. Heathrow cites local support showing in its own poll that 46 per cent support expanding the airport with 43 per cent opposed. But Hacan claim the poll was “out of kilter” with previous surveys, including the largest of its kind which showed more than 70 per cent of people in Richmond, Hillingdon and Hounslow against expansion. Sir Howard Davies’s aviation commission is currently consulting on the submissions to boost capacity in the South-East. He will publish his findings in December. 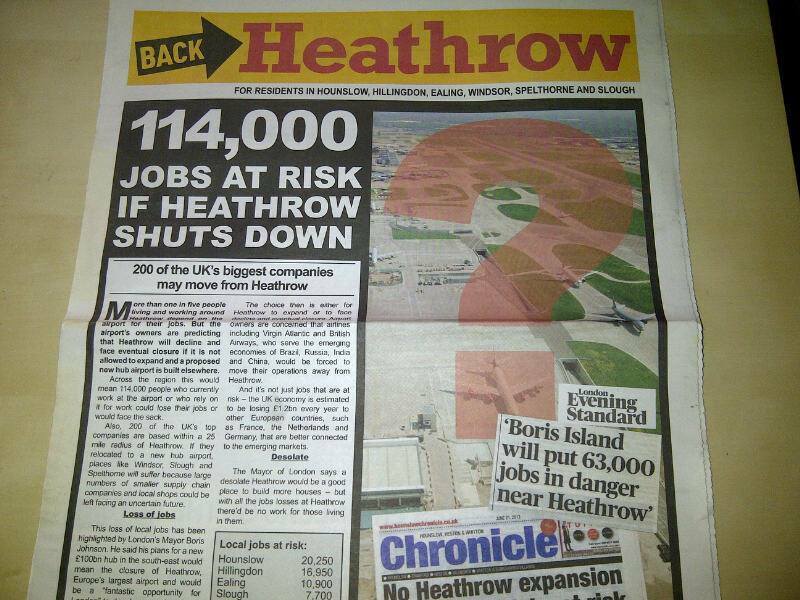 Last time Heathrow Airport Limited – then known as BAA – tried to get a third runway, it lost. The campaigners against expansion had widespread support within the local community. Heathrow Airport has learnt lessons from its previous failure. One of them is this: it needs to try to show that there is some local support for a 3rd runway. It is not at all clear whether people are being asked to back the continued existence of Heathrow or a third runway or both. 2. IT IS NAÏVE ON NOISE! Heathrow’s claim that a third runway will cut noise defies common-sense. Even with quieter planes, steeper descent approaches and other measures, people don’t buy the claim that increasing flight numbers from 480,000 a year to 760,000 will cut noise. Part of the reason Heathrow can claim this is that it has based its noise measurements on the outdated 57 decibel contour. People living well outside this contour are disturbed by noise and this is not taken account of in Heathrow’s predictions. 3. ITS POLL IS SELECTIVE. 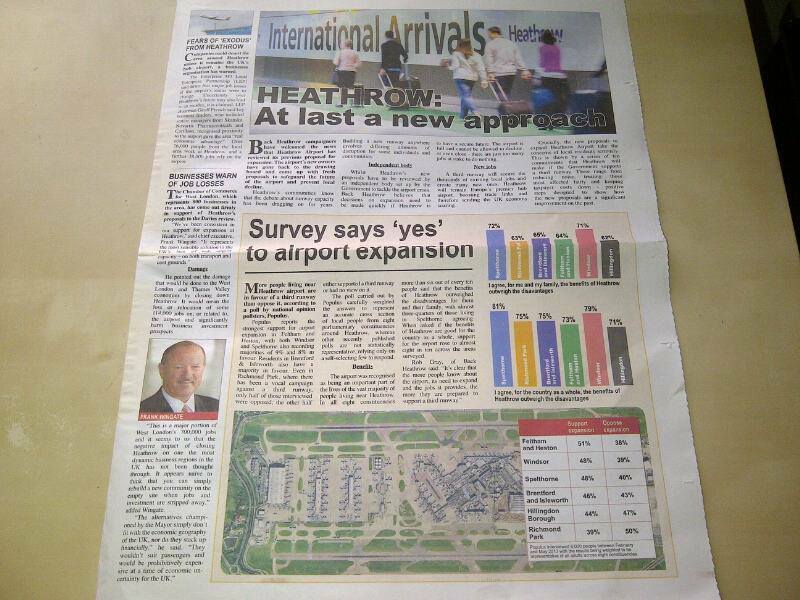 The poll, commissioned by Heathrow, found that 46% supported expanding Heathrow, compared to 43% who opposed expansion. Heathrow Airport knows the airport is very unlikely to close. What it really wants is support for a third runway. It should say so loud and clear instead of frightening people that closure is a real possibility. It is not. I’m writing to let you know in advance about a new campaign launching tomorrow. The media embargo is 09.00 Monday 9 September. Back Heathrow is a new community campaign to give a voice to the hundreds of thousands of residents who support Heathrow. The campaign has been established in response to polling published in June that showed more people in local communities around Heathrow back the airport than oppose it, and follows confirmation from the Mayor last month that his plans for a new hub airport would necessitate the closure of Heathrow. The campaign is being launched with funding from Heathrow Airport and will now begin the process of identifying and recruiting local support. 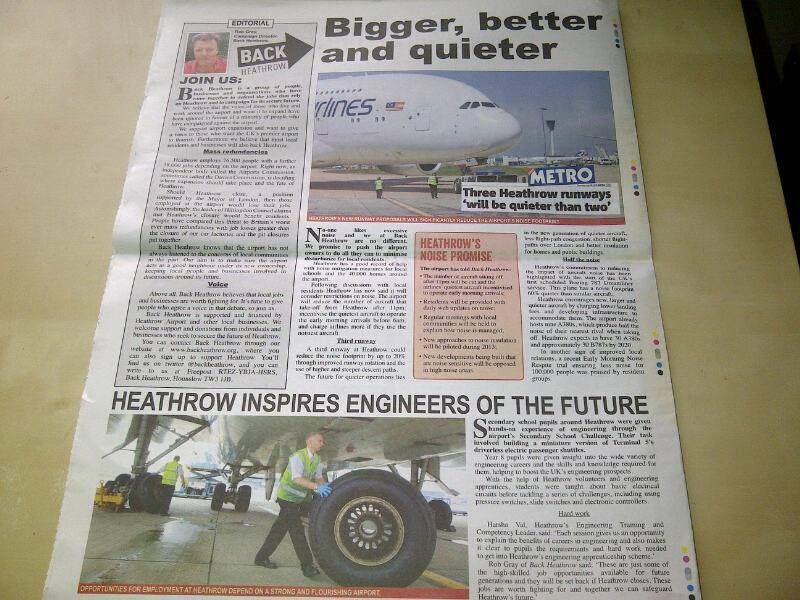 A new website, backheathrow.org, will go live from tomorrow, and from this week 400,000 local tabloid-style newspapers will be delivered to local communities surrounding the airport. Every household in your ward will receive one. We feel that for too long, the local residents who support Heathrow have been the silent majority in the debate on the airport’s future. As the campaign’s new co-ordinator, I am delighted to help provide a voice to the many local residents who back Heathrow and whose businesses and jobs depend on the future of the airport. If you need any more information, please don’t hesitate to get in touch. *I have removed the name of the ward to protect source.